Located 70 km north of Phuket, Khao Lak is a beach paradise with white sand beaches backed by lush green jungle. Day trips to the Similan and Surin Islands make this a perfect location. In addition, Koa Lak/Lam Ru National Parks are not far. A mix of excellent restaurants, tourist markets and hotels make this a perfect place to explore. With excellent beaches just a few kilometers away, beach lovers flock here to soak up the sun. 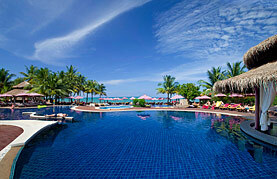 Khao Lak is the ideal destination in Thailand.